Vibrant colour is what print is all about – more specifically on litho. Contemporary graphic design is putting more strain on the traditional forms and processes of print – so what is the answer? We believe it is Hybrid Ultra Violet Curing – what we call Lightcure – our unique system uses just one UV lamp to cure the inks onto the surface of the paper instantly, using 60% less power than traditional UV. 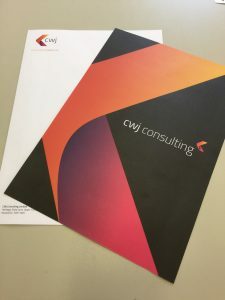 The beauty is you can enjoy vibrant colour on any material, and it is particularly effective with uncoated paper – something which is very much on trend at the moment, but tends to flatten any image beyond recognition. However with lightcure technology – as this image shows – we can create bright vibrant print, gradients and tints in CMYK on uncoated paper. Zavial Design has kindly granted us permission to feature images of this exceptional design, part of a client rebrand in which the designed created an elaborate design for the reverse of the headed paper. As you can see the challenge of maintaining the graduated tints as well as the ink weight plus brightness is a massive challenge. Realistically this clarity would not be achievable using traditional litho, but using lightcure technology it becomes very simple. The kicker – these were trimmed and despatched on the same day and due to being instantly cured, don’t mark during the finishing process.